IIChronicles 19:3 Nevertheless there are good things found in thee, in that thou hast taken away the groves out of the land, and hast prepared thine heart to seek God. The climate of this land and world has changed. There is a spirit of hopelessness manifesting on the hearts and mind of God’s people. We have turned toward looking to man instead of God for solutions to our problems. God has always used man and will continue to use ordained men and women of God to help us in this time of our life. There are ordained people set for this dispensation of time. God is calling for a people that will consecrate themselves for his work. Consecration means to set one’s self apart to God. We must eliminate our plan and allow God’s plan for our lives to be first. Our intellect always wants to change what God is doing when we feel we have a better idea. It must be God first! God can see what we cannot, His plan is perfect. We need a King, and that King is Jesus. There is a struggle in the land where we want the acceptance of man, but God is saying look to Him. We know that He is the maker of heaven and earth and all that dwells therein. (Psalm 146:6) God ways are higher than ours (Isaiah 55:9) and we must learn to trust Him only. David is a good example of how God will take the least of them and exalt him in due season. We must keep serving God and remember that He has a plan for our lives. He can take you from the prison to the palace, from the field to the castle. He will make you the head and not the tail, take you to high places where His glory will rest upon you. You will receive the benefits that come along with being an heir to the promises from your KING. This king is not based on the world’s definition but descended from Glory and Majesty and even took on the form of a servant. The Bible is still as powerful today as it has ever been and yes King Jesus lives today. 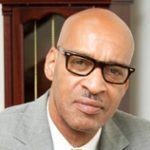 Author: Pastor James Murphy, Jr. 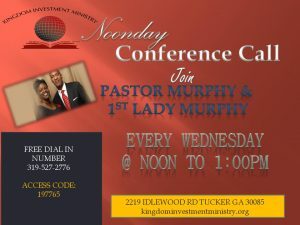 Please join us each Wednesday at 12:00 noon for an Anointed Word of God.